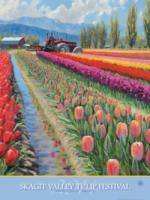 Every April the Skagit Valley explodes with brilliant colors of reds, purples, yellows and pinks during the annual Tulip Festival. This year, the 31st anniversary of the festival, miles of tulip fields were begging to be explored and photographed. 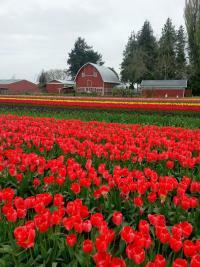 The Skagit Valley is about an hour and a half drive north of Seattle Southside. The weather in April is often unpredictable in the Pacific Northwest and the day my three friends and I decided to go was no different. The forecast called for partly cloudy with a chance of showers.The fields can get muddy so we came prepared with rain boots and coats. The festival is designed as a driving tour with no one farm designated as an official destination. 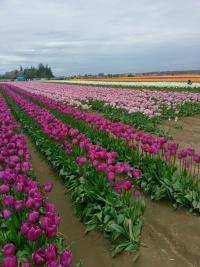 One of the more popular farms Tulip Town, was already getting busy by the time we arrived around It took a little searching but after finding a parking spot we headed to the entrance to purchase our tickets.Admission is $5.00 per person, cash only. Children under 10 get in for free. Once through the entrance there is a certain fairground aspect with several booths of crafts and sweets to purchase. There were tons of families with small children waiting in line to get their faces painted or or looking at kites in the kite shop. Wading through the chaos we made it outside to the massive fields and were overwhelmed by the display of colorful tulips. Rows upon rows of different varietals and shades of the rainbow went for almost as far as the eye could see. Parents were posing their children in the tulips to get adorable photos in their cute Easter outfits. Couples were creating romantic portraits to document the occasion and of course we needed photos as well! Most people are friendly and will oblige to be your personal photographer if you return the favor. 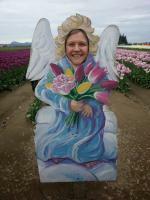 Activities to do in the fields consist of a tractor ride around the farm, posing in cardboard cut outs, and enjoying the numerous flower displays. Just as we decided we had seen everything we came for, it began to rain so we made our way to the exit. On the way out we stopped for a snack at one of the food booths and I purchased some tulip bulbs for gifts and grabbed a print of this year&apos;s poster. Every year the poster is designed by a new artist and reproduced on postcards, magnets, hand towels, anything else you could ever want. There are other less busy and touristy fields to explore along the valley and it is helpful to have a map of the area where all the fields are listed by flower variety.